Just a Drop: Branded Water Bottles, Personalised Drinks & Confectionery. promotional branded drinks and confectionery. Just a Drop are Europe’s leading supplier of promotional drinks and snacks, including high-quality branded water bottles, personalised soft drinks and customised confectionery. Increase brand-awareness with innovative – but cost-effective – campaigns featuring your logo and message. Whether it’s water bottles with your own unique label, fortune cookies featuring a personalised message or custom chocolates including your own design, Just a Drop’s commitment to the highest quality products combined with outstanding customer service ensures you can connect with customers, raise awareness and boost sales. 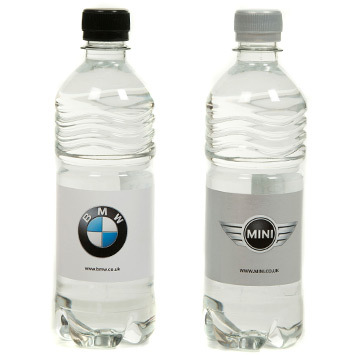 As leading specialists in the supply of your own branded water, we have the widest range and best delivery times for creating and delivering promotional water with personalised labels. We are able to personalise and ‘Own Brand’ a comprehensive range of drinks and beverages. This includes our ‘Healthy Options’ fruit juice and smoothie range. We have a comprehensive range of cookies and snacks. Our most popular product is the fortune cookie, that can be produced with personalised copy on the message slip inside the cookie. Our range includes the famous ‘English Mint Imperials’ in personalised wrappers or tins. We have an extensive range of mints that can be personalised using our twist or flow wrap packaging, mint dispensers and tins. We feature a comprehensive range of sweets that can be personalised to support your promotional activity. From the traditional twist wrap sweet in a range of flavours to Rock Sweets, Bars and Lollipops. Everyone is looking for something different and unique – Well we have it... Included in our wide range of chocolate promotional products we have our special Choco Graphic range – Chocolate with printing in full colour direct on to the chocolate. We have a Fast Track service on selected products. We can produce the product ready for delivery in 7 working days. Our UK based customer support staff a ready to answer and questions or queries you may have. Our product offer you a unique way to boost your awareness by creating memorable corporate gifts at your meetings, exhibitions and conferences. We have a unique range of products including: Juices, Mints & Sweets, Fair Trade Fortune Cookies. Our highly experienced team of designers can create artwork to your specification, we can even proof or amend your existing artwork to make sure everything is perfect. We can provide a 3D visual representation on various products so you can see what your product will look like. The water is fantastic. We are delighted. All received yesterday – they look great! We are absolutely delighted with the results and have received a lot of positive comments already. Thank you for your excellent service and we look forward to doing business again in the future. Fabulous thank you. I have been so very impressed with your service and really appreciate you keeping me updated with progress. Customer happy with the Own Brand Water Bottles and the turn around, thank you very much for all your help. Thanks again for you help, the campaign was a huge success.